WASHINGTON (AP) - "Medicare-for-all" is quickly becoming a rallying cry for many Democratic White House hopefuls, but there are growing questions about how to pull off such a dramatic switch to a government-run health care system. The debate over scrapping private insurers has heated up in recent days since Democratic Sen. Kamala Harris of California, a supporter of "Medicare-for-all," told CNN's Jake Tapper, "Who of us has not had that situation, where you've got to wait for approval, and the doctor says, well, I don't know if your insurance company is going to cover this? Let's eliminate all of that. Let's move on." But since her nationally televised remarks, several of Harris' rivals have pointedly spoken about their plans to work toward universal health care in more pragmatic, incremental ways. Those Democrats portray the single-payer health care proposal they've backed as only one strategy to achieve universal coverage, while emphasizing the importance of other, less sweeping paths. Among the skeptics, former New York Mayor Michael Bloomberg has said "Medicare-for-all" would "bankrupt for us for a very long time." At the forefront of the debate is Vermont independent Sen. Bernie Sanders' 'Medicare-for-all" bill, which holds out the promise of health care as a right, the potential for national savings from reduced administrative costs and government price-setting, and no more copays, deductibles or surprise medical bills. His plan envisions a four-year transition, phasing in the change by age groups. Simultaneously, some big tax increases would be taking effect. But there would be enormous challenges to put in place a single-payer health insurance with the government fully in control of the $3.5 trillion U.S. health care system, experts say. And polls show a looming political problem because many people don't yet realize it would mean giving up their private coverage. Another issue: Sanders' office says his plan would cover abortion, a major change from current federal laws and policies. Gillibrand, who crafted language in Sanders' bill that allows people to buy nonprofit insurance coverage during the transition, emphasized the importance of that bridge. "If more people buy into Medicare over whatever your transition period is, you will disrupt the insurance market . because you've created more competition for lower prices and quality care," Gillibrand told The Associated Press. "What I like about where the Democrats are today is, we have four or five versions of 'Medicare-for-all'," she added. "I think we all want to get to single payer. And I think the best way to do it is what I wrote in Sen. Sanders' bill." Booker, who declared his own candidacy on Friday, told a satellite radio show that day that he is "a big believer in 'Medicare-for all'- but I believe that if we give people a quality public option, we're going to be able to get more people into the system." And Warren, for her part, told Bloomberg TV last week that "multiple bills on the floor in the United States Senate" would accomplish her core priority of ensuring that "every American has health care at a price they can afford." Sens. 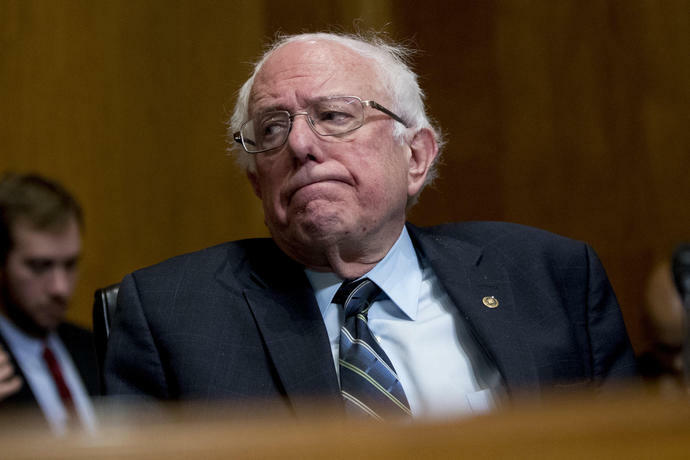 Amy Klobuchar of Minnesota and Sherrod Brown of Ohio also describe universal health care as an ultimate goal, but neither has signed onto Sanders' legislation. Brown has called for the expansion of Medicare to those over 50 as a more workable first step, while Klobuchar said in a recent interview that "on health care, there's a lot more that unites us in the Democratic Party." "One, we do not want to repeal" Obamacare, she added. "Two, we want to expand Medicaid . three, we want to improve on that as well as get to universal coverage." Others are less sanguine about a single-payer approach. "We can't pay for it, it eliminates choices, most versions...would make private health care coverage for almost all health care needs illegal, and it will diminish quality and access," said former Maryland Rep. John Delaney. "I think this is a great opportunity to put plans on the table and hopefully not have an early litmus test that says we only want to talk about one idea," said Sebelius. "I want to talk about 15 ideas." A long-time supporter of single-payer said Democrats should tread carefully. Now retired from political office, former Democratic congressman Jim McDermott of Washington said, "A single-payer system would be best if we had a magic wand, but in the real world it is going to be extraordinarily difficult to make this change." "I don't think that the full information that would really help voters is out there," she said. "You need to offer more specifics, and first of all about financing."